I'd like to say a very big THANK YOU to all the staff and students at Moorlands Primary for the wonderful welcome they gave me when I visited last week! This is a school that really believes in the power of reading for pleasure. Everywhere you go in Moorlands, you see books being celebrated and talked about; on the door of every classroom, there's an update telling you what the teacher is currently reading. And in the classrooms, there are amazing displays about books – like this one! So I really enjoyed talking to Years 6, 5, 4 & 3 about books and reading. They had a very wide selection of favourite books, which shows just how deep the reading culture is at this school. It was wonderful to hear some people say Varjak Paw was their favourite – things like that make all the hard work of writing feel worthwhile! 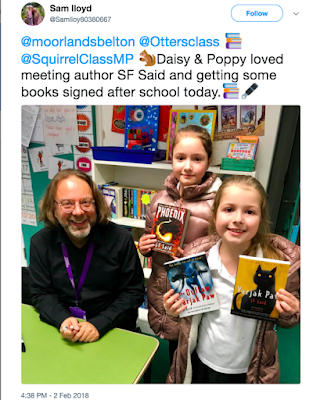 There were lots of excellent questions too, though we didn't have quite enough time to answer them all, so if anyone at Moorlands would like to ask another question, or to say anything about my visit or the books, just leave me a comment below! At the end of the day, it was a pleasure to sign books for everyone who wanted one. And it was absolutely amazing to see responses like this one afterwards on Twitter - so thanks again to Mr Lee, Mr Ruddick, Mr Biddle, Miss Eyles, and everyone else who made this such a special and memorable day! Thank you for such a fantastic visit. Deer Class thoroughly enjoyed it, and can't wait until your next book is published. Thank you so much - that's brilliant to hear! For anyone in Deer Class – and anyone else – who'd like to know more about my next book, here's a link to a blog post I made about it, which will tell you a bit more about the book, and why it takes me so long to write my books! Thank you for coming to our school and inspiring us to read and write more. It was really nice to meet you and we had such an exciting day listening to you speak. We can't wait for your next book to come out. Thank you so much, Otters Class – it was a pleasure to visit! And if any of you would like more writing tips – here's a link to a blog I made full of them!